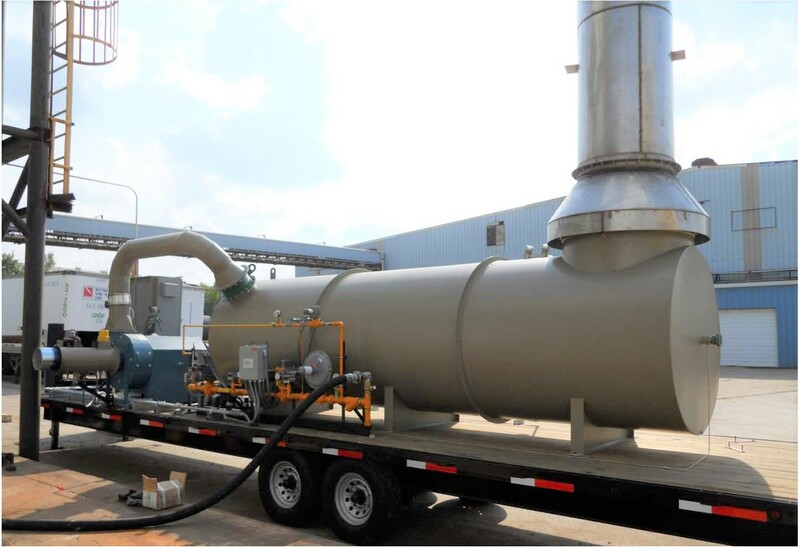 Mobile oxidizer systems designed to treat a wide variety of processes for short, medium and long-term use. Portable Thermal Oxidizers are a great addition to your permanent operating arsenal if your facility has frequent shutdowns or needs to address a variety of temporary requirements throughout the year. We also offer Portable Thermal Oxidizer Rentals and Wet Scrubber Rentals for short, medium, and long-term use . Pollution Systems manufactures Portable Thermal Oxidizers used for Tank Degassing prior to cleaning, to provide air treatment when existing pollution control equipment is shut-down for new equipment installation, or as a temporary air treatment solution for a new process and pilot studies. Thermal Oxidizers are used to capture and destroy harmful gas vapor from tanks that carry Volatile Organic Compounds (VOCs). When the chemicals, solvents or petrochemicals carried in the tanks are removed, gas vapor remains in the tanks. Pollution Systems' Portable Thermal Oxidizers remove and destroy the VOCs present in the vapor, preventing the release of harmful vapors into the atmosphere. They are designed for process flexibility and are effective for vapors containing high or low concentrations of VOCs, and can achieve destruction efficiency in excess of 99%. Variable waste stream flow rates customized to your application require-ments. Portable operation using trailer-mounted oxidizers. Trailers are DOT-approved, flat-bed trailers. Fans, burner, vaporizer and combustion chamber manufactured to industry standards and fully insulated to provide safe operation. Powered by natural gas or propane. Exhaust stacks are fully insulated with height above-grade-level for additional safety during discharge. Fully automated oxidizer operation, including system controls and safety interlocks. Flame trap, inlet manifold, knock-out pot and dampers ensure safe, efficient processing. Low maintenance operation in outdoor environments. NEMA 4 panel and enclosure are rated for outdoor use. Pollution Systems’ custom designs can provide you with a Portable Thermal Oxidizer to meet your desired requirements for quickly and efficiently performing Tank Degassing operations. We've designed and manufactured Portable Thermal Oxidizers for use in Oil and Gas projects, Chemical Operations and many Other Industries; plus, we have the skills and experience to engineer an efficient, cost-effective solution for Tank Degassing or temporary operations.